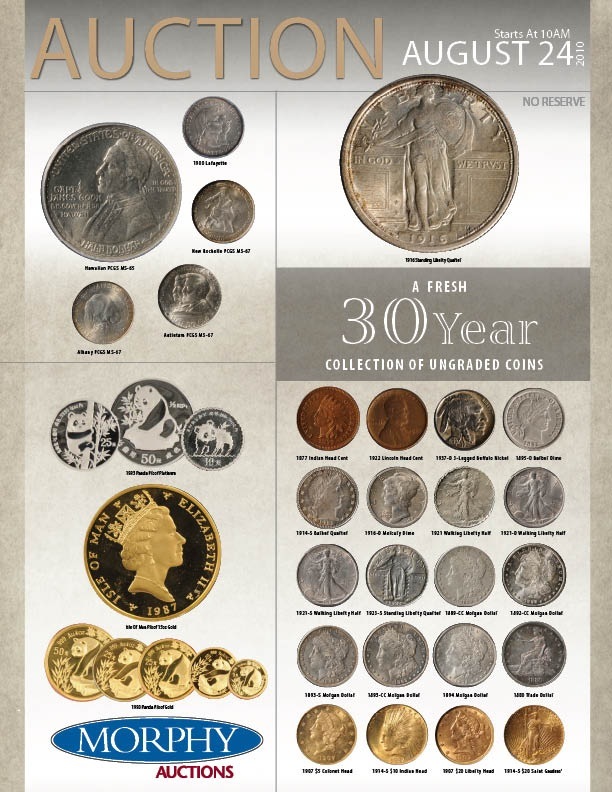 Fresh 30-year collection is centerpiece of Morphy’s Aug. 24 Coin Auction. On Tuesday, Dan Morphy will conduct a specialty Coin Auction comprised of three main collections. The sale’s centerpiece – a fresh to the market 30-year collection – consists of exceptional complete sets of coins in uncirculated condition or better. The collection consists of: Indian heads, Lincoln cents, Liberty nickels, buffalo nickels, Mercury dimes, Barber dimes, Liberty quarters, standing Liberty quarters, walking Liberty half dollars, Morgan silver dollars and trade dollars. The second featured collection is a commemorative half dollar set with all coins purchased from 1995 to 2000 in MS-65 condition or better. The third collection includes 75 international commemorative proof gold and platinum sets. All forms of bidding will be available, including in person in the gallery, absentee, by phone before or live during the sale, or live via the Internet through www.MorphyLive.com. For questions about any coin in the sale, call 717-335-3435 or e-mail dan@morphyauctions.com. The Morphy Auctions gallery is located at 2000 N. Reading Road in Denver, PA, on the Adamstown Antique Strip. View the fully illustrated catalog online at www.morphyauctions.com.